"Total creative control" has been Barbra Streisand's mantra for decades. For better or worse, few projects that bear her name have escaped her legendary meddling in every aspect of production. But in 1964, CBS executives scoffed at the presumptive and outrageous demand from the 22-year-old kid from Brooklyn during negotiations for her first television special. Sure, Streisand had wowed audiences as a guest on The Judy Garland Show the previous year and sold truckloads of albums, but did she deserve such complete creative freedom at such a tender age? (And most frightening of all, if she got it, what would she do with it?) The network hemmed and hawed, but eventually realized Streisand's talent was so explosive and her personality so unique, it saw no other option but unconditional surrender. Once the ink was dry on her lucrative CBS contract, Streisand and her creative team went to work, fashioning a bold concept that went against the grain of every previous TV special. No guest stars, no dopey comedy sketches, no pandering to the lowest common denominator. Just Barbra, and only Barbra, in three different sophisticated settings, singing for a solid hour, connecting one-on-one with the audience. Some called it crazy, idiotic, egomaniacal, but Team Streisand held firm. With fingers crossed, the CBS brass nervously awaited the rough cut. And when they saw it, they knew right away it was a very special special. America agreed. My Name Is Barbra garnered huge ratings and won a slew of Emmys, but more importantly, it was the first in a series of five Streisand specials over the next eight years�all impeccably produced programs that would capture this magnetic performer like she would never be seen again. Not every special in the group duplicates the freshness and vitality of her initial effort, but they all shine a spotlight on the fierce (and often fearless) creativity and individuality of one of the greatest artists of the 20th century. Love her or hate her, Barbra Streisand is undeniably a supreme vocal talent, and these five programs—all magnificently restored and packaged in a lavish DVD box set—capture her instrument at its youthful peak. 1965's My Name Is Barbra is the only special shot in black-and-white, but the monochromatic color scheme never detracts from the electricity Streisand generates. She opens with an extended sequence exploring her inner child, in which she navigates a complex series of interconnected sets while singing such eclectic fare as Much More from The Fantasticks, Make Believe from Show Boat, the sprightly juvenile ditties I'm Five and Sweet Zoo, and a soulful rendition of People, from the show in which she was currently appearing on Broadway, Funny Girl. After a mildly amusing monologue, the next segment allows Barbra to strut, vamp, and sashay all over the fancy New York department store, Bergdorf Goodman, while singing such humorously ironic standards as Give Me the Simple Life, I Got Plenty of Nothin', and The Best Things in Life Are Free. Then it's back to the concert stage for a knockout finale, climaxing with a dazzling Funny Girl medley; one of her first performances of Fannie Brice's signature My Man; and�over the closing credits�the unforgettable Happy Days Are Here Again. One word describes this final song set: breathtaking. Color Me Barbra aired the next year, and though it can't quite match its predecessor, it adopts an identical format and contains plenty of musical highlights. Instead of Bergdorf Goodman, Streisand employs the Philadelphia Museum of Art as a backdrop for her opening song cycle, rushing through various galleries and fantasizing about the paintings and sculptures that beguile her. A circus segment follows, and includes a requisite monologue, along with a medley of animal-themed standards sung to roaming llamas, penguins, and pigs. As in My Name Is Barbra, these sumptuous set pieces supply a heady dose of eye candy and a bit of humor, but also diminish ever-so-slightly Streisand's impact. To sublimely satisfy, all Barbra needs is an empty stage and a 40-piece orchestra, so it's no wonder the concert sequences work best. And in Color Me Barbra, the final two songs of her mini-concert�Where Am I Going? from Sweet Charity and Starting Here, Starting Now�eclipse everything that's gone before them. After her acclaimed London debut in Funny Girl, Streisand returned to the US to work on her next special, a distinctly American affair in which she would honor one of the nation's most revered show business forms, vaudeville. The resulting program, The Belle of 14th Street, has not been seen since its initial 1967 air date, and though it possesses some charming moments and meticulously recreates the period (right down to the audience wearing vintage costumes), it lacks the incendiary sparks of Streisand's previous two efforts. For the first time, Babs shares the stage with other performers, including Jason Robards, Jr. and tap dancer extraordinaire John Bubbles, for a series of "acts" in which she plays various characters. These musical comedy sketches allow Barbra to abandon her familiar Brooklynese and adopt Irish, German, and Southern accents (Streisand's no Meryl Streep in the linguistics department, but she's not bad! ), as well as sing opera and spoof Shakespeare. In the final (and best) sequence, she appears as the title character, and performs a host of very old standards, including Some of These Days, How About Me? and I'm Always Chasing Rainbows. Even a slight head cold can't impair Streisand's glorious vocals, though it does prompt an ever-so-slight crack during the climax of Melancholy Baby. Never have I heard the slightest imperfection in a Streisand performance (she simply won't allow it), so this miniscule blemish bears mentioning�and proves the diva is blessedly human. A definite and not entirely successful departure for Barbra, The Belle of 14th Street remains a noble experiment, and will surely please her diehard fans. Much more to everyone's liking is 1968's Barbra Streisand: A Happening in Central Park. Filmed live in front of 135,000 (yes, that's one hundred and thirty-five THOUSAND) fans on a summer night in New York City, this one-woman concert captures the essence of Streisand the performer. Gone are the concepts and backdrops; this is pure Barbra, alone with a mike, belting, clowning, crooning, and connecting with a sea of enraptured supporters. Originally a two-and-a-half-hour concert (you should see the list of songs that didn't make the final cut), CBS truncated the program to fit a one-hour time slot, but thankfully keeps the magic intact. Streisand performs many of her greatest hits�Cry Me A River, I Can See It, Down With Love, Second Hand Rose, People, and Happy Days Are Here Again�with all the control, power, and emotion she can muster (and that's saying something!). She throws in a couple of novelty tunes for good measure, but two inspirational ballads—Natural Sounds and Silent Night (yes, the Christmas carol)—weave a hypnotic spell, and beautifully draw the home viewer into the concert's outdoor setting. I love My Name Is Barbra, but for me, A Happening in Central Park is what Barbra Streisand is all about. Five years passed before Streisand's next foray into television, and during that time she smoothly morphed into the Hollywood diva and political activist we know today. Second Hand Rose was now a distant memory, and in her place stood Malibu Barbra—tan, a bit blonder, more hip, and willing to embrace more contemporary pop music. Barbra Streisand... And Other Musical Instruments�not seen since its original 1973 airing�reflects this evolution, but is a bit too avant-garde for my taste. Streisand takes a worldwide, multicultural view of music, flipping tried-and-true standards on their ear with jarring international arrangements. She also indulges in some techno pop (before there ever was such a thing) with a synthesized rendition of By Myself. The special's best segment teams Barbra with Ray Charles for a duet of Crying Time and a sublime (if slightly abbreviated) solo of Sweet Inspiration/Where You Lead, one of my all-time favorite Streisand selections. She should have ended the program with her soaring performances of I Never Has Seen Snow and On a Clear Day You Can See Forever, but instead decides to close with the gimmicky The World Is a Concerto, in which appliances (like electric juicers, blenders, toasters, and vacuum cleaners) join the orchestra and accompany her. A few instances of lip-synching and canned audience applause soften the visceral punch of this very uneven special, but Streisand's artistry carries the day and makes it worth watching. Individually, each of these fascinating specials includes an array of memorable moments, but as a collective body of work, Barbra Streisand: The Television Specials (1965-1973) documents the creative, professional, and individual evolution of one of the world's most talented, popular, and visionary performers. It's a stunning set, and makes one pine for that long ago time when a "special" was truly a TV event, and a single artist could hold us spellbound for one magical hour. Streisand could, and did, and thanks to these DVDs, we'll never forget how it feels. Image Transfer Review: A renowned perfectionist, Streisand only accepts the best, so it's no wonder the transfers for these vintage specials look fabulous across the board. Old-timers may remember viewing the programs when they originally aired, but they certainly didn't view them like this. Superb resolution, excellent contrast, vibrant colors, and no print defects whatsoever make these specials look like spring chickens instead of old birds. The black-and-white My Name Is Barbra benefits from solid, inky blacks and a gray scale that rivals a feature film, while the color programs enjoy such presence and depth, it almost seems like Babs is in the flesh in our living room. Only A Happening in Central Park looks a little ragged, due, of course, to the outdoor setting and live concert atmosphere�elements Streisand, much to her frustration no doubt, couldn't manipulate. Audio Transfer Review: Each special contains three audio options�original mono, 2.0 stereo, and DD 5.1. Once again, all are first-rate, offering clean, dynamic sound, full of fidelity and nuance. Of course, the 5.1 option provides the most enveloping experience, allowing the vocals and applause to wrap around us, but both the stereo and mono tracks beautifully capture Streisand's artistry. The live nature of A Happening in Central Park does afflict audio quality, resulting in very mild distortion, but its impact is negligible. Extras Review: For such an exquisitely produced set, the lack of extras is a bit disappointing. Three of the specials—My Name Is Barbra, Color Me Barbra, and A Happening in Central Park—include video introductions by Streisand taped in either 1987 or 1990 (depending on whether one believes the information on the discs themselves or what's printed in the accompanying liner notes) for their VHS debut. Impeccably dressed and lit (of course! ), Barbra reminisces about the various concepts and production problems, tells a few anecdotes, and sprinkles in some trivia, all in a very relaxed, off-the-cuff manner. It's too bad, though, she couldn't be convinced to film new introductions for The Belle of 14th Street and Barbra Streisand... And Other Musical Instruments, which would certainly benefit from retrospective insight. Audio commentaries by La Streisand also would have been a treat, as well as a documentary featuring unused footage from A Happening in Central Park (if it still exists) and interviews with various behind-the-scenes personnel, but alas, no such luck. The set's packaging, however, is very creative and chockablock with Streisand photos and information. The five discs are housed in a fold-out panel, and beneath each disc lies a continuing timeline of Streisand's career, beginning with the Broadway premiere of Funny Girl in 1964 and ending with the album release of Barbra Streisand... And Other Musical Instruments in 1973. The pièce de résistance, however, is a lavishly illustrated, artistically designed, and well-written 58-page book, which provides background info and scene-by-scene analysis of each special, along with scads of rare photos. 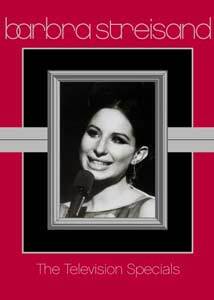 A dream come true for Streisand's legion of admirers, and a must-own for anyone who appreciates first-class musical entertainment, Barbra Streisand: The Television Specials (1965-1973) presents one of the world's foremost talents in a series of rare, innovative, and often thrilling performances, two of which haven't been seen for more than 30 years. Exceptional video and audio quality make these newly restored programs look brand new, and showcase the magnetism of a young, energetic, and supremely confident and gifted star in the midst of her meteoric ascension. Happy days are here again, indeed. Highly recommended.